This talking character introduces the Wilson Koprup mystery. 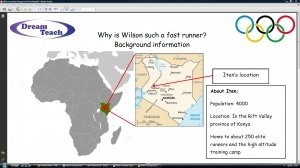 Pupils need to use the clue cards and background information sheet to investigate why Wilson Koprup, a Kenyan athlete is such a fast runner. This background information sheet accompanies the clue cards and avatar introduction. 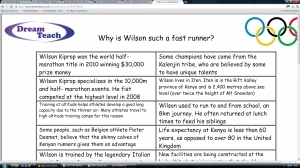 These clue cards ask pupils to work out what makes Wilson such a quick runner. 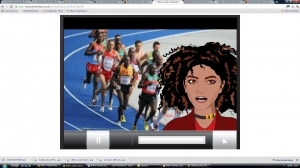 The mystery refers to Kenyan Wilson Kiprop, the 2010 half-marathon world champion. There is also a background information sheet and introductory avatar to accompany this mystery.. This recap movie outlines the mystery showing pupils the key themes in the mystery.